Benedictine Brother Luke Waugh professed solemn vows as a Benedictine monk of Saint Meinrad Archabbey in a liturgy on Jan. 25, 2014, in the Archabbey Church at St. Meinrad. Brother Luke, 49, was born in Weston, W.Va., where he attended Lewis County High School. He was a member of Our Lady of Perpetual Help Parish in Salem, Va. He graduated from Radford University in Radford, Va., and worked in information technology for a company in Roanoke, Va. He joined the monastery in 2009, and made his first profession of vows in January 2010. Brother Luke is in formation for the priesthood at Saint Meinrad Seminary and School of Theology. 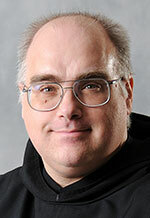 He is an assistant to the oblate director for Saint Meinrad’s Benedictine oblate program.